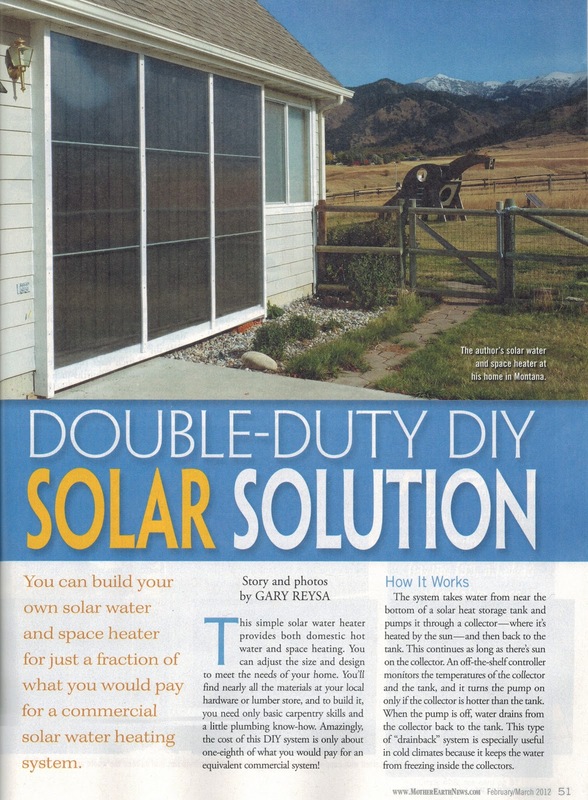 The new (February 2012) issue of Mother Earth News has an article on our DIY solar system that heats water for domestic use AND also provides space heating. The emphasis for this system was to provide both solar space heating and solar domestic water heating while still keeping the system simple and easy to build. All the lessons learned over the past five years by me and others who have built the system are included. As I've said here and elsewhere, you've provided a fantastic service by meticulously documenting the design and installation of a good quality cold climate solar water heating system. What bothers me is that if it takes 100 pages to describe it, then there won't be much uptake. So if anyone has ideas on how to streamline and simplify, I'm all ears! One step is to use a prefab tank. American SolarTechnics, for example, has some affordable options. I think Kevin would agree that this is still in the experimental phase, but keep an eye on it if you are thinking about a system. I think it is great that Mother Earth News published how to make your own solar thermal panels. Home Power has not even done that. I am seriously thinking about making a heating system for my green house that is a thermal syphon system. I live in Truckee, CA which is very cold and the pants in the green house can use all the heat they can get. And just cover the panels during the two months of "hot" temps up here.